Luton boss Nathan Jones lamented his side’s ‘naive’ defending, as they were beaten 3-2 at home by fellow promotion chasers Wycombe Wanderers last night. The Hatters chief saw Paris Cowan-Hall open the scoring inside two minutes, before Nathan Tyson was given the freedom of the penalty area to make it 2-0. We created enough chances to have won the game, it’s just defensively, we were very, very poor. Although Elliot Lee pulled one back, Tyson sprinted away to put the Chairboys 3-1 up, with Lee’s second goal of the evening turning out to be a consolation. A frustrated Jones said: “It was a wonderful advert for football if you’re a neutral in terms of end to end stuff, chances at both ends, but from my point of view, naive defending has cost us the game. “Going forward, we had no problem, I thought we were very good in possession. We created enough chances to have won the game, it’s just defensively, we were very, very poor. “To concede a goal after a minute, we lost the ball in their half, we didn’t go with the runner. “Then the one who robbed it off the one who lost the ball (Olly Lee), he had more desire to get back into that area and he scored and that was symptomatic of us first half defensively. “We concede from a set-play, a poor set-play, second phase set-play and we can’t show them any more as it’s clear what they do. They go, they win that, especially with (Adebayo) Akinfenwa and we didn’t defend well enough. “We’ve lost a header in our box and I can’t understand how it’s got to the boy. “They’re all avoidable goals because we’re in possession, both full backs had an opportunity to put balls in, both underhit crosses, and then they break and score. “So one, we’ve got to be better in the final third and two, we’ve got to make sure we don’t get hit with a sucker punch. 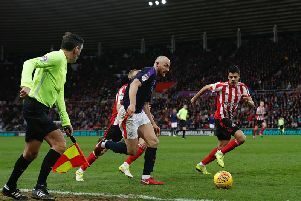 Jones didn’t have any issues with his sides play at the other end as Chairboys keeper Scott Brown made some magnificent saves to ensure his side came out on top, denying James Collins, Alan Sheehan and Harry Cornick in the final minute. He added: “We had enough chances to have got something out of the game, even at 3-2, Harry Cornick’s gone clean through, one-on-one and should score. “Attacking-wise, no problem, I can’t criticise our attacking play. “We scored two and should have had three, four maybe, then it shows you’re a good attacking side. “It was just defensively, we needed someone to organise and shut up shop and not to concede and we conceded at bad times. “We conceded straight away, conceded the second from a set play and just when we’re in the ascendancy, we concede a third, that’s basically the tale of the game.